McDonagh's, Kilmileekin, Maam Valley, Galway. The Connacht Property Auction held its first public auction of 2018 on Tuesday last week in the Menlo Park Hotel, Galway. Of the 15 properties on offer, 14 were successfully sold, giving an impressive 93 per cent success rate for the first event of the year. After a successful run of auctions in 2017, the auction team were expected to start 2018 off in a similar manner, and they did not disappoint with continued interest on the majority of lots that were offered. The first lot of the event was a large public house located in Kilmileekin, Maam Valley, Galway. 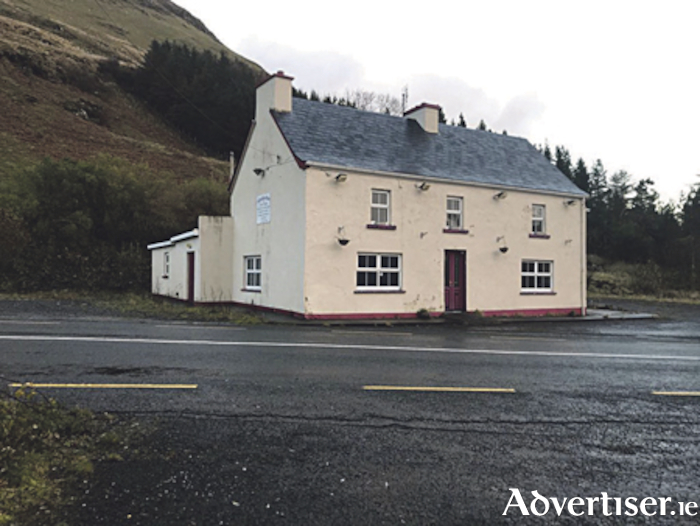 The property is known locally as McDonagh’s and was offered for sale in partnership with Spencer auctioneers, Oughterard. This fine two storey building was sold with the added benefit of a seven day trading licence. The property had significant interest in the lead up to the auction, and after 20 bids the property was sold for €89,000 to a delighted new owner. A well located, three bed bungalow was sold in partnership with Matt O’Sullivan auctioneers, Clifden. The property at Kylemore village had strong interest pre-auction interest and was successful sold for €210,000. In partnership with Property Partners Emma Gill, Ballinrobe, the auction team successfully sold a well presented four bed family home in south Mayo. The house, located in Cross village, was subject to strong bidding from both local and national buyers and parties were quick to raise their bidding paddle on this lot. After more than a dozen bids at the auction event, the property was eventually agreed at €115,000. Elsewhere in Mayo, in partnership with Gerard Hanley auctioneers, Claremorris, the auction team offered to the floor a large parcel of land in a number of different lots. There was strong local interest in these well located agricultural and forestry lands. The auction team saw two of the three lots offered sold under the hammer on Tuesday, with the final parcel of land under offer. An ideal family home in Leitrim was sold in partnership with Gordon Hughes, Ballinamore. Glostermin, Gorvagh, had early interest from local buyers and was sold for €85,000 to a delighted new owner. The Connacht Property Auction is now welcoming entries for its 45 day online auctions and the next public auction taking place on the April 24. With thousands of registered buyers and the impressive success rate, it seems the Connacht Property Auction will remain a popular method of selling and buying a wide range of properties. The Connacht Property Auction team are confident their public auctions will continue get the right results for their clients, and state there is demand for family homes, agricultural land, and investments across Connacht. The company does not charge any upfront costs into the auction and takes on board all marketing and entry fees. To discuss selling your property by auction or to arrange a free valuation, call the auction team on 091 882 121 or visit www.connacht propertyauction.ie.